I just moved to Germany, which means that I get a lot more weather than when I lived in Spain. There, a quick once-a-week check was plenty to know whether you should get the umbrella from the attic. In Germany, I check every time I want to leave the house. 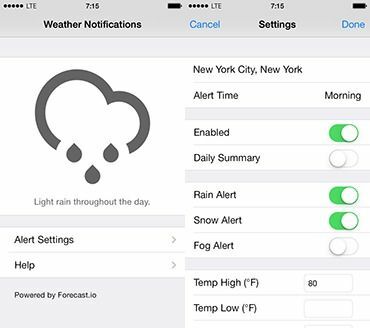 And now there’s a great app which will will let you customize your own weather notifications, right there on your iPhone. It’s called, appropriately enough, Weather Notifications. You fire up the app to configure it, and then it delivers customized warnings to Notification Center. Tell it where you are, and whether you want rain, snow and fog alerts, as well as a daily summary. Then, when the appropriate conditions are met, it pushes you an alert. Pilots, surfers, cyclists and people who feel the cold will appreciate the wind and temperature alerts, too. The only problem is that it won’t really work for me in Germany. The app uses the excellent DarkSky and Forecast.io data sources, which don’t really work outside the U.S. So if you have any good German weather alert apps, let me know via email or Twitter.